Hybrid golf travel bags are lately the rage among both novice and seasoned golfers, most notably because they offer the best of both worlds – a golf bag with a shell top to protect your clubs, and a soft cover that’s easy to carry and store your valuables and golf gear in its integrated pockets. Buying the best hybrid golf travel bag can feel like an overwhelming task owing to the plethora of options available. But after diligent research, we bring you the lowdown on 3 excellent choices in this segment to ease your buying decision. 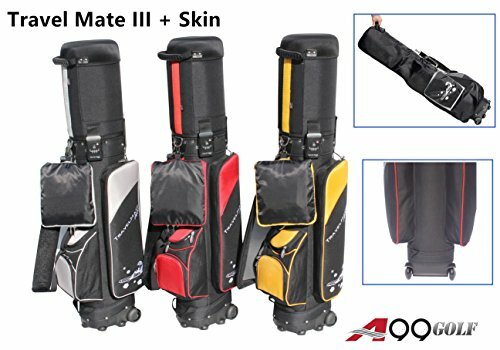 The A99 Golf Travel Mate III hybrid golf travel bag slots in at the No. 1 position in this list of best hybrid golf travel bags for several good reasons. 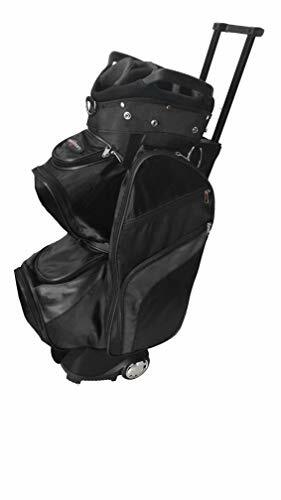 For starters, this 2-in-1 golf bag boasts a robust hard hood construction complete with a hard steel ring in the interior, which collectively can resist heavy pressure. Available in a choice of four exciting color combinations – Black/Grey, Black/Gold, Black/Red and Red/White, the Golf Travel Mate III hybrid golf travel bag tips the scales at just 10.4 lbs., and is crafted from premium quality 600D nylon and 420D padded dobby nylon, so you can rest assured it will serve you well for many seasons to come. Further, it is fitted with heavy-duty wheels at the bottom, a comfort padded, webbing single shoulder strap, and a tow and pull handle up top, making it easy to haul it around on the airport or course. The A99 Golf Travel Mate III hybrid golf travel bag features a 6-way divider top, two long pockets, front side ball pocket with clear mesh window + 2side mesh pocket, a secure TSA digital lock with 3 Velcro straps, and a soft rain hood cover to protect your golf gear from harsh weather conditions and theft. Brought to you by one of the biggest names in the golf space – CaddyDaddy, the Co-Pilot Pro 2 is in a league of its own due to its sturdy 900D all-weather fabric construction. Adding to this, this hybrid golf travel bag sits on a rugged molded base with inline skate wheels so it easily travels for any use. 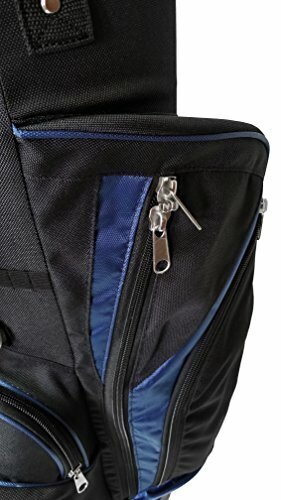 Available in a choice of two appealing color combinations – Black/Blue and Black/Grey, the CaddyDaddy Co-Pilot Pro 2 golf bag is generously spaced, and features 6-zippered pockets, 6 full-length padded dividers that can accommodate between 12 and 14 clubs and towel and umbrella rings. The Co-Pilot Pro 2 hybrid golf travel bag is appointed with 4 hook and loop straps to keep the top secure, and is backed by a 1-year full replacement warranty against any manufacturer defects and even against any damage caused by airlines. If you’re looking for a hybrid golf travel bag that comes with innovative features and offers superior durability, the Co-Pilot Pro 2 bag is worthy of a second look. The CaddyDaddy Roadrunner Wheeled hybrid golf travel bag weighs just 7.2 lbs., and comes with several great features, some often seen in only higher priced models. It features a 15-way top with 3 full-length dividers, allowing to easily store and gain access to your clubs. Furthermore, it sits on a molded wheel base fitted with inline skate wheels, and is fitted with a telescopic handle and padded shoulder strap to carry it around the course easily. Available in two color combinations – Black/Grey and Black/Blue – the Roadrunner Wheeled hybrid golf travel bag is also equipped with two towel rings with hook and loop glove attachments, and a rain hood with umbrella ring to protect your clubs in wet weather conditions. When it comes to space and compartments, the Roadrunner Wheeled hybrid golf travel bag takes home the gold with an insulated, oversized cooler pocket, ten zippered pockets and two felt-lined pockets for your valuables, all accessible from your golf cart. For a bag that allows you to carry all your golf gear with ease, you really can’t go wrong with the CaddyDaddy Roadrunner Wheeled hybrid golf travel bag. 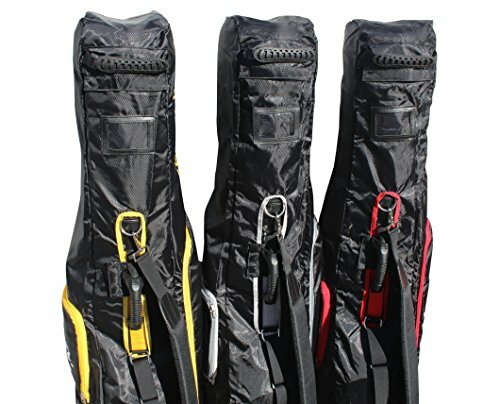 Hybrid golf travel bags make it extremely convenient to carry your golf gear and other essentials on the golf course and in the airport. This an ultimate solution for snowbirds. The three best hybrid golf travel bags come with several innovative features, making them a hit in their segment. The A99 hybrid golf travel bag comes with several compartments, is available in a plethora of color combinations, features a TSA security lock and 6-way divider top. The CaddyDaddy Golf Co-Pilot Pro 2 also comes with a 6-way divider top and can accommodate up to 12 to 14 clubs. Although it features high quality 900D all-weather fabric construction, it is only available in two color combinations. On a brighter note, and unlike most bags in this segment, it does come with a 1-year warranty against any manufacturer defects, but also against any damaged caused by airlines. 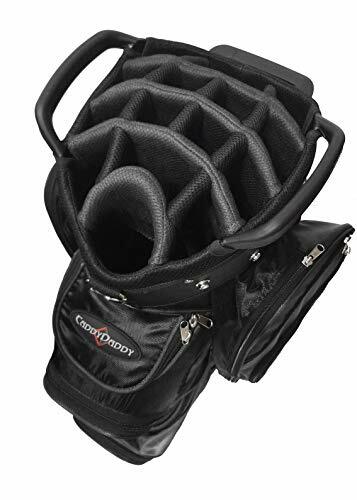 If you’re going to be carrying many golf clubs and still need space for your other gear, the CaddyDaddy Roadrunner with its 15-way divider top, 10 zippered pockets and 2 valuable pockets, making it an ideal choice.